Oh how I love the spring and fall, when the greens are plentiful at the farm. Right now we are being treated to spicy arugula, Asian salad mixes, baby kale, lacinato and other varieties of mature kale, collard greens, and Swiss chard. While this is a delicious boon to us CSA members, it can be somewhat of a challenge to eat all the greens before they go bad, especially if you have a full share. So I’d like to offer a few tips with you and some recipes for using up those greens while they are still fresh and full of nutrients. And full of nutrients they are. In general, greens are probably the healthiest food on the planet. Most are full of vitamins K (good for bone and cardiovascular health), A (great for eye health) and C (awesome for immune support) and many important minerals like calcium and potassium. They are also high in fiber and various important micronutrients like antioxidants that fight inflammation and are believed to fight off diseases such as diabetes, heart disease, Alzheimers , and even cancer. Make it a greens day. Spend some time on pick-up day boiling a big pot of water and cooking greens in batches (by variety) just until they are tender. Then drain and gently squeeze out the water from the greens and store them in airtight containers in the fridge or freezer. These cooked greens will last longer than fresh green and can be used for any number of dishes such as noodle or grain bowls, pasta dishes, quiches or frittatas, omelets, soups/stews, chili, casseroles, or grain or rice dishes. Make green smoothies. I have offered recipes on the blog before, but it is easy to forget this method, which uses a large handful of greens for each smoothie. 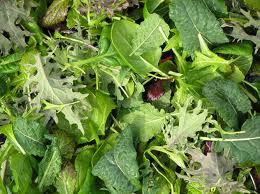 All greens available now at the farm, except for maybe the spicy arugula, would work well in a green smoothie. Smoothies are also a great way to enjoy the still plentiful raspberries. Put greens in every kind of dish you can think of ….mac n cheese, pasta, meat stews, chili, soups, casseroles, even if the recipe doesn’t call for it. Also, keep in mind that salad mixes like the baby kale and the Asian mix can be added to cooked dishes (they aren’t just for salad). Use greens for breakfast. Make a large frittata or quiche to enjoy for breakfast. The baby kale, arugula or Asian mix would make a delicious breakfast salad, with some cooked quinoa, raspberries, kohlrabi and a fried egg. Or try sautéed greens over toast topped with a poached or fried egg. Make a large salad and a lot of vinaigrette and have it readily available for every meal. The radishes, kohlrabi, overflow peppers and cauliflower, bok choy or napa cabbage, and carrots (if you have any left) are all great salad additions. This recipe is hearty, healthful and delicious. It was adapted from Fine Cooking Magazine, Oct/Nov 2014. You can substitute kale or collards for the chard if you wish. Chop chard leaves and top 3 inches of stems (1/4” slices) and reserve separately. Cook bacon in a 8-inch cast-iron skillet until crisp. Using a slotted spoon, remove bacon bits to a paper-towel lined plate to drain. Pour off all but 1 tablespoon of bacon grease. On medium heat, cook onion and garlic for 3 minutes. Add potatoes and cook, stirring frequently, until potatoes become tender and begin to stick to the bottom of the pan, about 6-8 minutes. Add chard stems and cook, stirring frequently, for 2 minutes. Add chard leaves and bacon bits, and cook, stirring frequently, for 3 more minutes or until chard begins to wilt. Meanwhile, whisk eggs, egg whites, Dijon mustard and salt in a medium bowl until well combined. Add cheese and mix well. Pour egg over vegetable mixture in pan and stir to mix well. Allow to cook for 2-3 minutes. As if cooking scrambled eggs, slowly scrape egg from the sides to the middle as you work your way around the pan. Smooth out egg mixture evenly and cook another 2-3 minutes, scraping from the edges to the middle once more around the pan. Smooth out mixture and allow to cook until mixture bubbles throughout and looks almost set (except for the top), about 3-5 minutes more. Heat broiler and place rack about 6 inches from broiler unit. Place frittata in pan onto rack and close oven door. Cook for 2-3 minutes, or until frittata is puffed, browned on top, and appears completely set. Remove from oven and cool for 5 minutes. Run a knife around outside edge of frittata to loosen sides. If you wish to turn out the frittata onto a plate, run a thin spatula around the entire bottom of the frittata. Place a plate upside down on the top of the pan, and using oven mitts, gently turn the pan with the plate upside down to release the frittata (there will be a thin layer of browned goodness that stays on bottom of the pan which is normal). The ease and cleanliness of this step depends upon how seasoned and “non-stick” your skillet is. If you have concerns about being able to release the frittata from the pan, simply cut out slices and serve them directly from the pan. Strip or cut away the leaves from the stem of the chard and keep the leaves and stems separate. Cut off 1 1/2” inches of the bottoms of the stems. Then thinly slice the rest of the stems. Heat a skillet (preferably a food safe non-stick skillet) over medium heat. Add oil and allow oil to get hot. Add garlic and chard stems. Cover skillet and cook, stirring once or twice, for about 5-6 minutes, or until stems get tender (if they start to stick or brown, add a bit of water). Meanwhile, chop the chard greens into bite-sized pieces. Add greens to the pan, sprinkle with salt and pepper, and stir well. Cover again and cook, stirring a couple of times, for 3-6 minutes or until greens are tender. In a stock pot, heat olive oil over medium-low heat until hot. Add onion, carrot and celery and cook, stirring occasionally, until onion is soft and beginning to brown, about 8 minutes. Add rosemary, oregano, and garlic and cook, stirring constantly, for 1 minute. Add diced tomato with juices, broth, and lentils. Stir until combined. Bring mixture to a boil, reduce heat, and simmer, stirring occasionally, until lentils and vegetables are tender, about 15-20 minutes. Remove from heat. Add salt, red wine vinegar and arugula. Stir until arugula wilts. Ladle stew in soup bowls. If desired, sprinkle with Parmesan. Serve.